You know me, size queen. 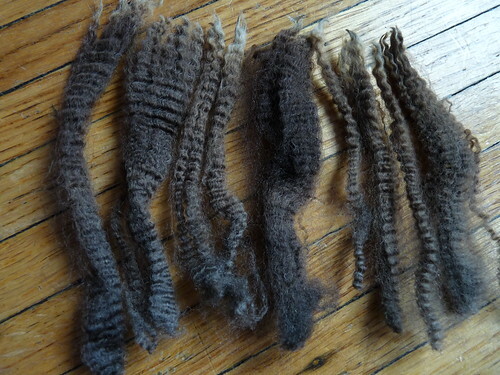 It's a combination of things-- one being I know I can't reliably blend a variegated fleece on the combs (I could, but it would mean combing it all and then blending and goodness patience is not one of my strong suits.) 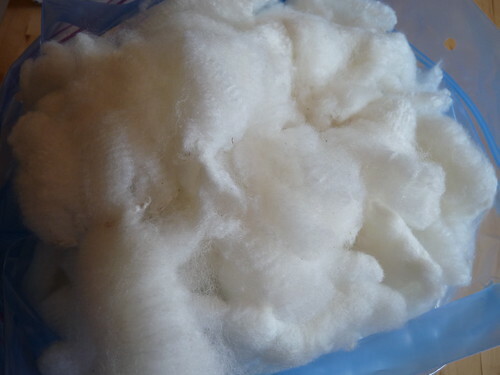 Another would be the cleanliness of the fleece. I'm spoiled. I know :) I seek out super clean, coated fleeces since I wash here at home and anything washed off goes down my sink-- so I try to keep the dirt down the drain to a minimum. The fleece overall is very clean, but its tips are gunky and opening them up means more dirt inside. 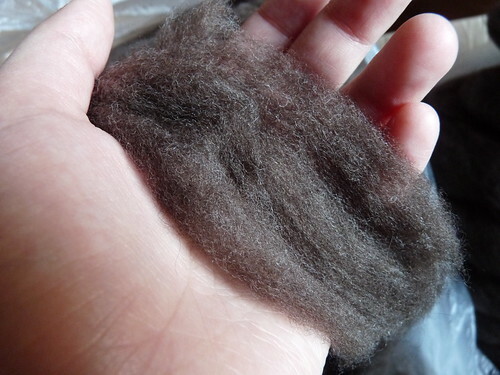 So I'm not sure what this fleece's future will be. Part of me is tempted to wash in large chunks then space dye it-- then comb it (or flick card and spin from the individual lock). 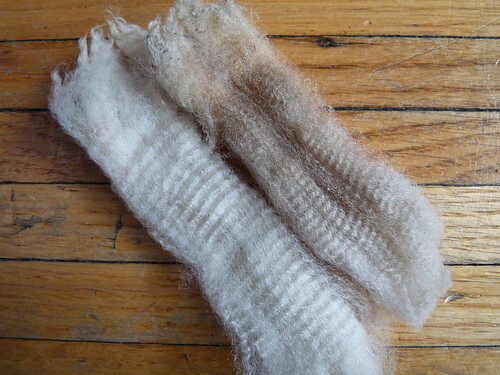 The resulting colors would probably be amazing if my dye job were up to par... but 2# washed, dyed fleece would be a lot. 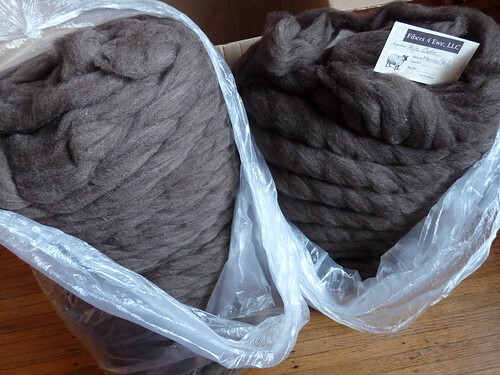 Another part wants to ship the 3# off to Spinderella's and have them deal with the washing and blending-- I know that I'd get back a beautiful, oatmeally-colored roving of wonderfulness. For now? Packed back into the closet! Since I was going over the fleece for pics and maybe for mailing, I pulled off a few samples that may be interesting to yall. These happen when the shearer goes over the same spot on the sheep in more than one pass-- sometimes you'll find little short-short bits of staples (1st pic) and sometimes you'll find a staple shorn in half or less (2nd pic). It's a hard job, shearing... and I don't think I have seen a fleece with NO second cuts (these were the few I found in this one). Left in when carding they'll turn into little neps in your batts, left in combing they'd get combed out but there's no reason not to pull them when you see them. 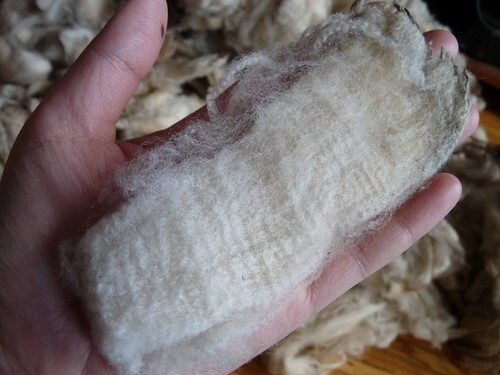 When I say 'fine' here, it's not the fineness of the fiber (micron diameter, fine wool like merino etc.) but how many crimps there are per inch. 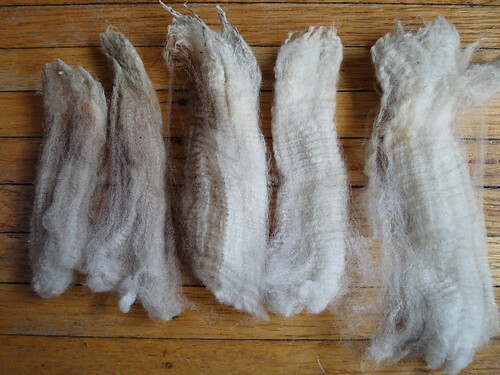 You can see that the darker staple has more crimps per inch and the whiter staple has fewer-- fine vs strong *for this fleece and breed. 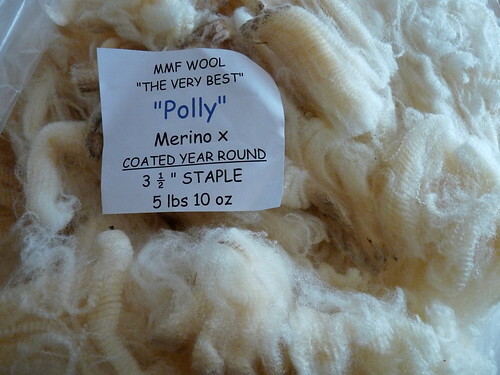 * A finely crimped Romney may have as many crimps per inch as the stronger crimp of this Polwarth. 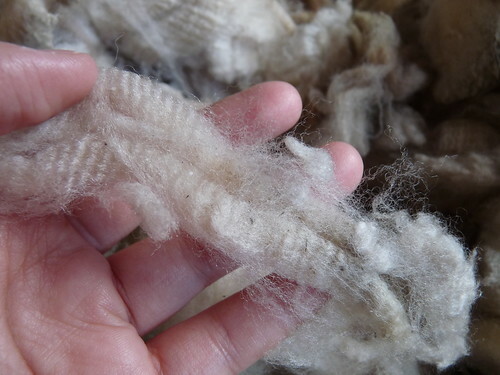 I've seen lots of online sellers of wool take the time to describe the type of crimp in the fleece they're selling and how even that crimp is across the fleece; here you can see a fleece that has a variation across the fleece (but not the staples themselves). Intention? No question-- next in line for washing up here at home and eventually handcombing. I'll blend my own two shade of grey from the black and white-- this small amount of blending I don't mind and is actually pretty fun. 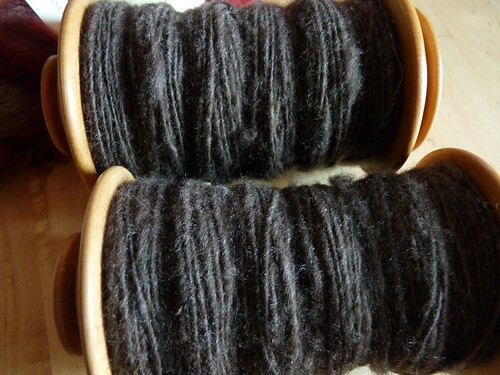 Remember I had taken the shorter staples of the brown merino and sent it away with a pound of yak down for blending/carding into pindrafted roving? It just came back and is really, really great. I think a merino/yak o w l s converted into a cardi would be awesome. Maybe would have enough leftover for an Estes Vest, too. Bearskin romp? I caught that, you naughty thing. :P And also I HEART that sweater. Thanks for the link! I'm totally making one for me, and for a future kiddo in my life. wow. 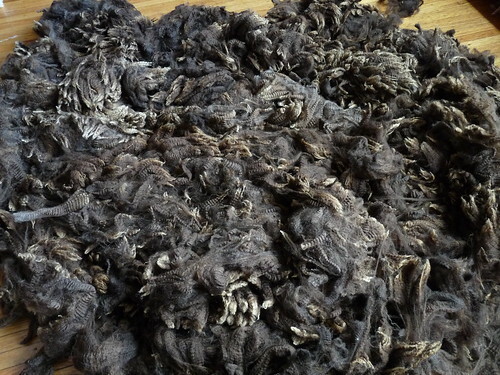 that is a LOT of fleece! It is amazing how different it all is....funny - a friend of a friend owns fiber4ewe!!!! It's right near me!!! Wow! Just wow. 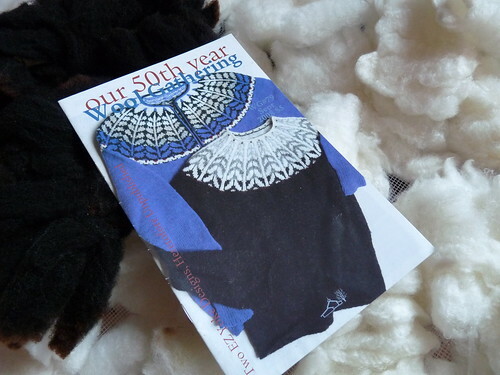 Can't wait to see Owls knit up in handspun, I'm in love with that sweater! 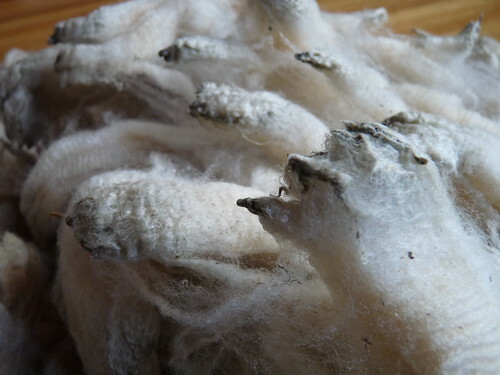 I love looking at all your fleece adventures! The black and white is going to be marvelous. man, I can't believe how much fleece you have! if I had all that fleece, I'd arrange it in one giant pile and then swim in it. of course, I don't spin, so I'd have no other choice. I am not a spinner and have little desire to do so, but this post is LUSCIOUS! It does tempt me to the "dark side". 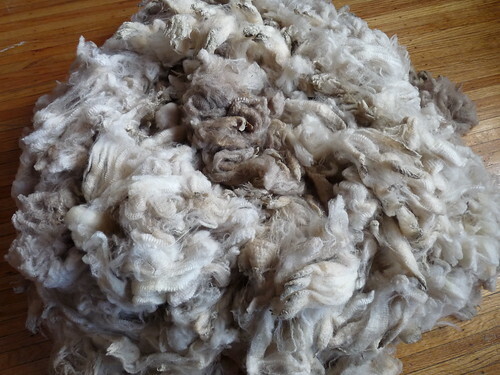 I so cannot wait until I get to work a project from fleece to the end. 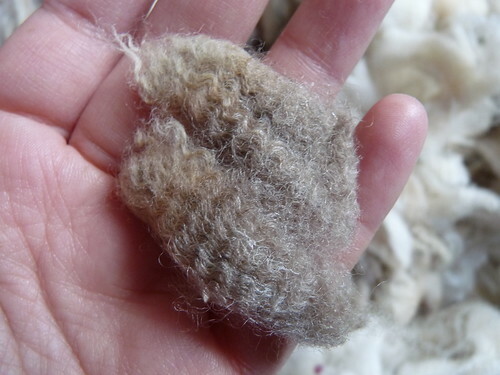 I love seeing your post about working fleeces. 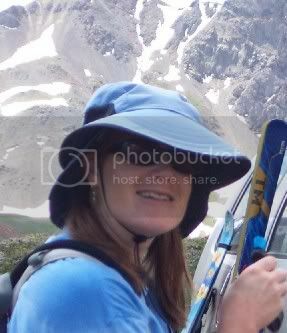 You need to change your blog name to Fleece Pron. Want more fleece? My covered sheepies are getting shorn later this year...hee.